The Turbo mounting foot has been designed specifically for use with the Turbo Series of in-line centrifugal fans. The one size of Turbo Mounting Foot fits all units and one foot is included with all Turbo fans as standard supply. Additional feet can be supplied as an optional extra. 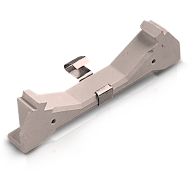 The foot fits into any one of three positions in the fan housing and is held in place with a spring clip.